President Mnangagwa says his Government will do everything possible to assist investors keen on starting businesses in Zimbabwe and has urged those interested to take the first mover advantage to explore the abundant investment opportunities in the country. The President said Zimbabwe was now a vision every progressive person wanted to be associated with given ongoing economic reforms and innumerable virgin investment opportunities it presented. He made the call at a luncheon attended by scores of Swiss and international businesspeople, hosted by the Africa Swiss Business Circle in Zurich, Switzerland, where he attended the 48th edition of the World Economic Forum (WEF). The luncheon was sponsored by Quantum Global. Investors at the high-profile Zurich meeting included billionaire Mr Urs Shwarzenbach, a private investor and owner of the Dolder Grand Hotel. He is based in the United Kingdom and his worth is estimated at between $1,5 billion and $2 billion. Mr Shwarzenbach owns real estate across the world, but principally in Switzerland, Morocco, Australia and Scotland. Also in attendance were Glencore Global Head of Oil, Alex Beard, Lonrho Group chief operations officer Bruno Sidler, Swiss Re managing director Bruce Hodkinson, ABB head of global relations Tobias Becker and Swiss Africa Business Circle managing director Michael Rheinegger. President Mnangagwa encouraged investors to visit Zimbabwe to get first-hand experience of the limitless investment and business opportunities and an insight into areas they would want the Government to address. “(Zimbabwe) is a greenfield, a virgin economy. If an area is virgin, many people would want to go there. So I encourage all investors to come and taste the pudding. The country is open for business,” the President said. He clarified that this was not merely a nice message Zimbabwe was putting out to the world, but that it would be backed by actions. “We may say nice things, but on the ground you find that there are issues that need clarification. We will direct them to correct authorities. If you find that a door is closed, a situation which was common in the past dispensation, come to my office and I will open that door,” he said, emphasizing that his Government had adopted a zero tolerance to corruption. He noted that the work ethic in the new administration had changed. “In the first days, staff would find me at work. But that has changed now as nowadays I find them there.” President Mnangagwa also highlighted the point that Zimbabwe was now open for business and pledged to decisively deal with corruption; a cancer partly responsible for problems the country is facing. He said while the country was ranked low on the global corruption index, his administration’s “zero tolerance” to the vice would see Zimbabwe in a significantly improved position in the next rakings. The President called on investors to look at tourism, which is considered one of the low hanging fruits towards economic growth. “Victoria Falls is very beautiful and she faces Zimbabwe. If you want to see her from the back, go to Zambia, but if you want to see her from the front, you need to come to Zimbabwe.” President Mnangagwa has been on a charm offensive to woo investors as his administration seeks to do business with global investors by ending years of isolation. According to Reserve Bank of Zimbabwe Governor Dr John Mangudya who presented on the investment opportunities in Zimbabwe, the country has vast tourist attractions ranging from natural to man-made historical sites. Opportunities in the sector were in the hotel and catering industry, safari and tour operations, gaming and construction of international convention centres. The meeting in Zurich concluded the President’s engagements in Switzerland, which he used to maximum potential for engagements and interactions with business and political leaders and investors. 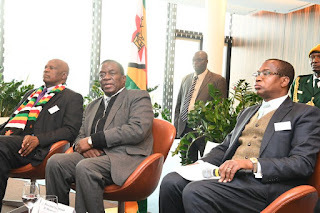 About his experience in Davos at the 48th World Economic Forum, President Mnangagwa said he had interacted with a lot of delegates some of them a top official from the United States (John Negroponte, former deputy secretary of state). “One of the US top staffers came to see me and I gave him a good message. In my interview with (Richard) Quest… there was a push for me to comment on what (US) President Trump had said in relation to Africans and select countries.